Kinya, webmaster of the Polish multi-game fansite Babagra, has posted a summary and notes of the second EQ2 Insider webcast which was held last Wednesday. – new Loyalty items added to MarketPlace. – lore and legends for Aerakyns (June/ July). Ethereals and Artifacts – current items will be available until mid of July then comes another set of items: weapons. June Dev Picks (from 10:30): Magic Kingdom by Sairalindie on Antonia Bayle and Meta’s Enchanted Island Tours by Metamarra on Butcherblock. New Dressable NPC Actors called by Kaitheel “Annimanequins” (from 24:00). You can choose what player race you want it to be, then customize it similar to when you create a toon. You are able to give them single animation like “boggle”, “giggle”, “sit” when someone comes close to them. You will be able also to give them some text so when someone will approach them they will see the text. Those NPC will be either craftable or by Loyalty points. 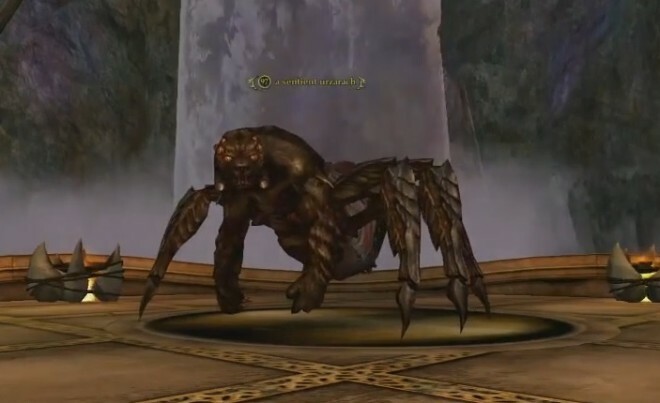 Devs showed also new NPC from forthcoming expansion (from 29:00) – SpiderBear “a sentinet urzurach”! Are those babies on the back of the spiderbear? No. It is just a part of the spidearbear. There are many more questions and answers viewable by visiting the RRC Raiders site where Kinya posted these notes!